The 2012 Progressive International Motorcycle show will soon hit the northwest on December 16-18th at the Washington State Convention Center in Seattle. Attendees can check-out new bikes from Aprilia, Beta, BMW, Brammo, BRP, Darwin, Ducati, Erik Buell Racing, Gas Gas, Harley-Davidson, Honda, Husqvarna, Indian, Kawasaki, KTM, Moto Guzzi, MV Agusta, Norton, Star, Suzuki, Triumph, Victory and Yamaha. There will also be the latest aftermarket parts and accessories. Not only will there be new bikes, but the show is jammed pack with other events and activities. There is the Learning Curve – an interactive stage with industry experts presenting a variety of motorcycling topics for both new and experienced riders including adventure riding, motorcycle maintenance, increasing bike performance, seminars for women riders and more. There will be Demo Rides for licensed motorcyclists. There is the Custom Bike Show – where motorcycle builders will showcase elite-level custom motorcycles competing for a piece of a $90,000 cash purse prize and a chance to compete in the U.S. Championship, at the Daytona Beach Motorcycle Show, in March. 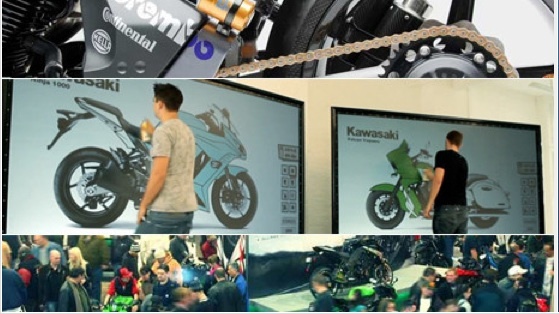 The Smage Bros will have a motorcycle trials stunt riding show and attendees will also get a chance to create their own motorcycle design at the Kawasaki Design-A-Bike kiosk, featuring a brand new digital spray-painting technology available only at these shows. Three years ago I sold my (purchased new) 1978 Yamaha YZ 400 to a good buddy. At the time I was downsizing and making room in the garage for other more active projects and the bike received little ride time. My buddy had plans to ride with his kids and though there are days I regret selling the ‘ol yellow buzz bomb, I know it has a good home! The vintage MX was clean, ran very strong and was most reliable. Meaning it would sit for months in the garage and within a couple three kicks blew blue smoke on any neighborhood kid brave enough to stand next to the ride. I recall that Yamaha expanded on a good thing with the 1978 YZ’s as it became very stable with the box section aluminum swing arm and longer travel (at both ends). The bike was a bit heavy (tipping the scales around 240 lbs.) but long gone were the cracks in the frames, common with the previous (non-Monocoque) designs. The rake was also a bit long which made that year YZ400s better at cross-country than in motocross. The bike was always more motocross(er) than I had skills. Get cocky and it reminded me of broken ribs near Lee’s Camp…so, I’d back off the go-juice! Speaking of dirt bike riding and the main point of this post – I want to raise your awareness on the Consumer Product Safety Improvement Act (CPSIA). It bans numerous youth products with lead content and prohibits selling them. Simply put the consumer product law passed last year bans the sale of quads/ATVs, dirt bikes and associated accessories for use by young people (Youth 12-15). This was the response from our legislators after the outrage and calls to do something when U.S. toy companies allowed China to ship lead-laden toys to American toddlers. However, these ‘youth’ products are prohibited for no good reason, and quad/dirt bike manufactures have demonstrated that they should be excluded under the law, however, they have yet to obtain an exemption from our “big”…yeah, they are working for us… government! Clearly the provisions of the law place an unfair burden on the Powersports industry and it’s yet another example of broad-brush legislation with no thought about the unintended consequences. I’m unaware of any child suffering lead poisoning from chewing on an ATV fender, foot peg, motorcycle seat, or handle bars in any garage?! So how did this new set of economy damaging laws get passed? Last Saturday, the CPSC approved the sale of vehicles designed for 12- to 15 year-old riders, units that had been previously banned under the CPSIA, however, the recent statement was simply a verbal clarification that CPSC staff believes that Y12+ ATVs are not subject to the law…not a written exemption or reversal and causing confusion for retailers. Industry members and enthusiasts have sent thousands of e-mails to Congress through ARRA and other letter-generating Web sites like the motorcycle industry council. If you want to stop the ban on youth dirt bikes, ATVs or quads please visit the web sites and weigh in on the topic. Meanwhile I’m going to think about hard-core motocross bikes from KTM….where’s that brochure?